At Ameritex, we’re constantly brainstorming ways to streamline the moving experience. Since we’re the home of the Stress-Free Move, we know it’s critical to have access to the latest technology. That’s why going paperless is the right move for us. Read on to find out more about our paperless process, and how it can help simplify your next move. Keeping up with paper contracts, invoices, and receipts is not a stress-free or convenient experience for our customers. Paper is easy to lose track of and can lead to communication breakdowns and general inconvenience. Now, our movers and dispatch team are equipped with tablets for a more streamlined and efficient process. When your movers arrive, they’ll have all of your information on hand. Additionally, you’ll be able to review your documents and sign electronically. Electronic files make locating and organizing your documents simple — no more digging through stacks of paperwork! This efficiency translates to a stress-free experience for our team members, our movers, and our customers. It’s a win—win—win. As Ameritex transitions farther and farther away from paper, our environment also benefits. Part of loving our community involves loving our planet, and going paperless allows us to achieve many of our earth-friendly initiatives by creating less waste and consuming fewer products that harm the environment. Doing away with pesky paper contracts and other paperwork is only the beginning. We look forward to simplifying more of our processes beyond this exciting first step of going paperless. 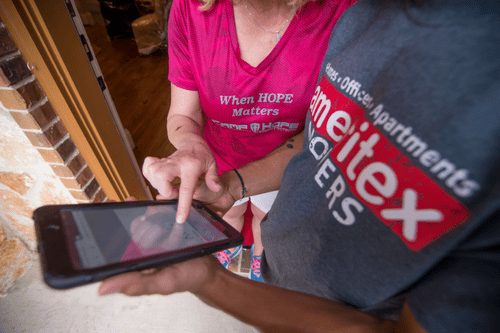 Make no mistake — we at Ameritex are serious about revolutionizing the moving industry. For us, it’s about so much more than completing moves, checking off lists, and collecting payments. We’re truly passionate about moving, as well as the clients we serve and the Houston community. If you’re moving within the Greater Houston Area, call us today at 713.484.6683 for your complimentary moving quote.